Ticket from the Iron Man Game. 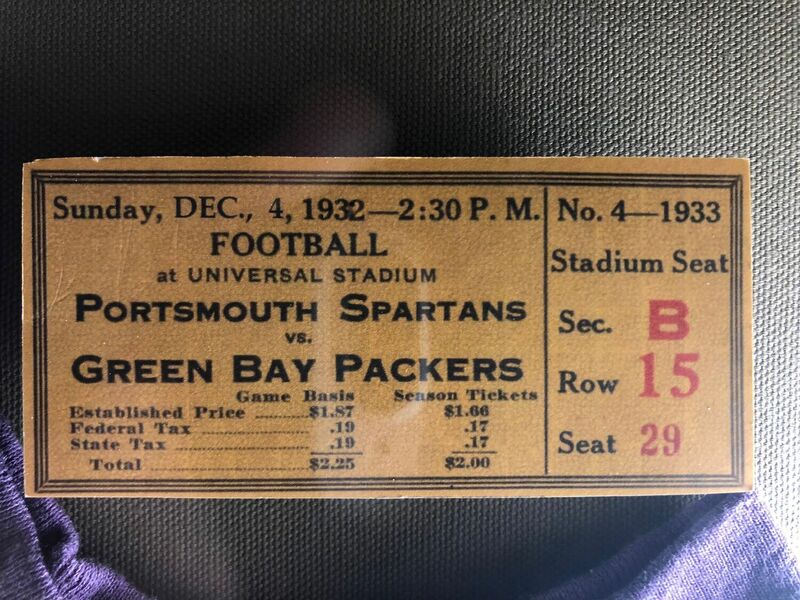 This ticket, for section B Row 15, Seat 29, sold for $2.25 in 1932. That is the equivalent of approximately $44 today. In Comparison, a Bengals tickets from the 2018 season begins at around $43. Spartan tickets were expensive and cost prohibitive for many local residents. This led to poor ticket sales and the team's eventual departure. Back in early December 1932, at the time of the Iron Man Game, Portsmouth, like the rest of the United States, found itself in the depths of the Great Depression. National unemployment is estimated to have reached 23.6% and would top out at 24.9% in December of 1933. To what degree ticket costs contributed to the disappointing receipts is difficult to determine. Seat tickets to the Iron Man Game cost $2.25 in 1932 dollars. Adjusted for inflation, the tickets would cost $41.53 in 2018. For comparison, during the 2018 NFL season, the Cleveland Browns had the cheapest average ticket price of $66.34. Cincinnati charged on average $78.61; and the league’s most expensive ticket was the Los Angeles Chargers at $199.10.